At Walsall Trading Standards we are all too well aware of the problems caused by rogue traders especially in the building and home improvement sectors. In addition to the financial loss and distress caused to consumers, rogue traders also have a negative impact on the business of reputable traders. We have developed the Walsall TraderRegister in response to these concerns. 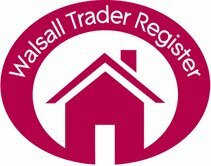 Walsall TraderRegister is not an approval scheme but is a register of businesses in the Walsall area. It is promoted by Trading Standards and its partner agencies to consumers in the borough as a means of finding a reputable trader and avoiding falling victim to rogue traders. Thank you for your interest in the Walsall TraderRegister. The TraderRegister covers all aspects of home improvement and repair work, including building, carpentry, external property repairs, decorating and home security. In choosing a business form the Trader Register and following our simple advice to getting it right first time, you can make an important step to find a reliable trader to work upon your home. If you have any questions or would like to speak to a member of the Walsall TraderRegister team, please do not hesitate to contact us.